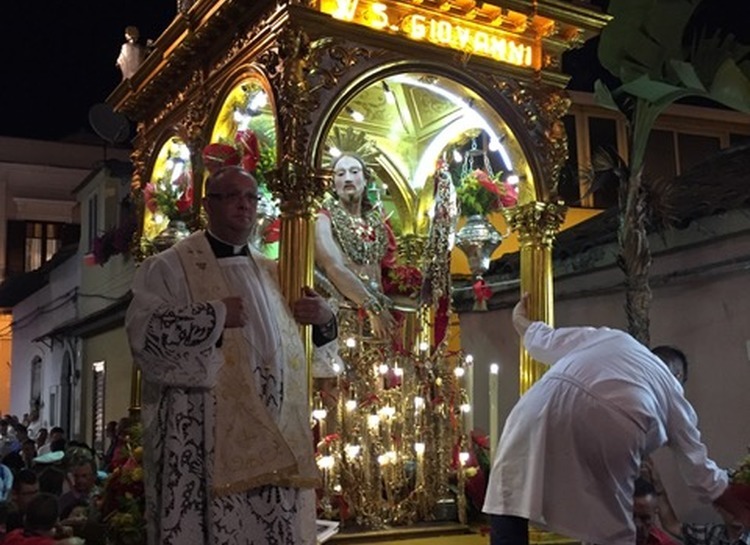 A few nights ago, while I was strolling through the streets of a fisherman village in Sicily, I found myself in the middle of a religious procession in celebration of the festival of Saint John. The site of a young devotee clambering onto the procession cart that carried Saint John immediately caught my attention. 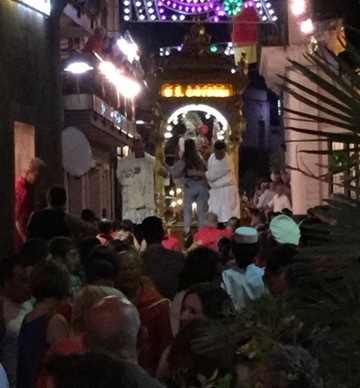 The group of men dressed in red whose job it was to carry the cart through the town’s narrow streets had brought the parade to a halt so the young devotee could have her private moment with the saint. Myself and the entire crowd of people watched as the faithful woman took her place in front of the statue and began expressing her devotion to the saint through prayerful mummers, eager fingers that reached to touch his body and respectful lips that placed a loving kiss on his cheek. As if to keep this holy experience in her presence forever, she wiped her own yellow and red scarf across his body and held it tight as she stepped back down to the street to let the cart continue its procession through the town. Reflecting on the image of this scene I am reminded of an ancient ritual known as the ‘washing and opening of the mouth’, that thousands of years ago generated the creation of divine statues by the people of ancient Sumer in southern Mesopotamia (i.e., southern Iraq). Just as with modern day religious processions, this ancient community used this event to vivify their deities and get in touch with the divine world. The rituals associated with the presentation of these statues to the public can be considered forms of devotion, but most importantly they served to transform the supernatural world from an ethereal dimension of theological knowledge into something real and accessible. The physicality of the divine world through the creation of vivified statues made it more understandable and less scary. 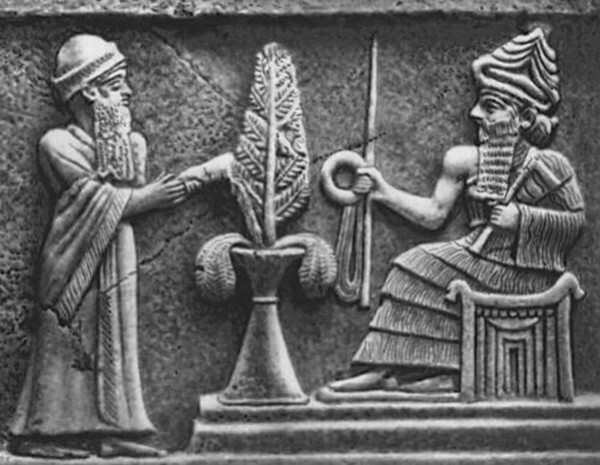 The power that material culture embodies in creating and reinforcing religious beliefs is a timeless element in connecting people with the divine as recognizable in the representation of Saint John in the Sicilian catholic community and in the vivification of the divine statues among the ancient Sumerians. In fact, isn’t impossible to imagine Christianity without the Holy Cross, Judaism without the remains of the Temple in Jerusalem, Islam without the mosques and minarets, Buddhism without the statues of Buddha, and so on for all the religions of the world (ancient and modern)? This brief reflection on ancient and modern materialization of religious beliefs helps illustrate my main objective as director of the newly founded School of Religious Studies at the Center of Ancient Mediterranean and Near Eastern Studies, which is to investigate how to break the boundaries between beliefs and practices and to connect material culture with theological dogma and ideas. I believe that what Saint John’s devotee experienced during that night couldn’t exist without the physical expression of the spirit of Saint John in the wooden statue carried around by the procession of devotees. This is typical of the festivities of the saints in southern Europe as well as in South America, but it can also be reconstructed through the clues left behind by ancient people and brought to light by archaeologists. Thus, the approach I will introduce to the newly founded centre SoRS will be that of the ‘material turn’ that has recently started to characterize the field of religious studies and has also been pivotal in recent research in the field of the archaeology of religion through the use of network analytical tools. Objects are in fact part of a more complex network of elements that includes the uttering of sacred words, the playing of instruments, and the smells and taste of food. Religious beliefs cannot be treated only from a theological and philosophical perspective, but they have to be interpreted as the results of how the components used during ritual practices are experienced by the involved members. This innovative perspective will guide the research carried out by SoRS, as well as teaching activities in collaboration with the Lorenzo de’ Medici International Institute both in Florence and Rome. This is the beginning of a long journey that I hope will help the general public, religious communities and interested scholars in finding new perspectives for the definition of the divine among ancient and modern societies.